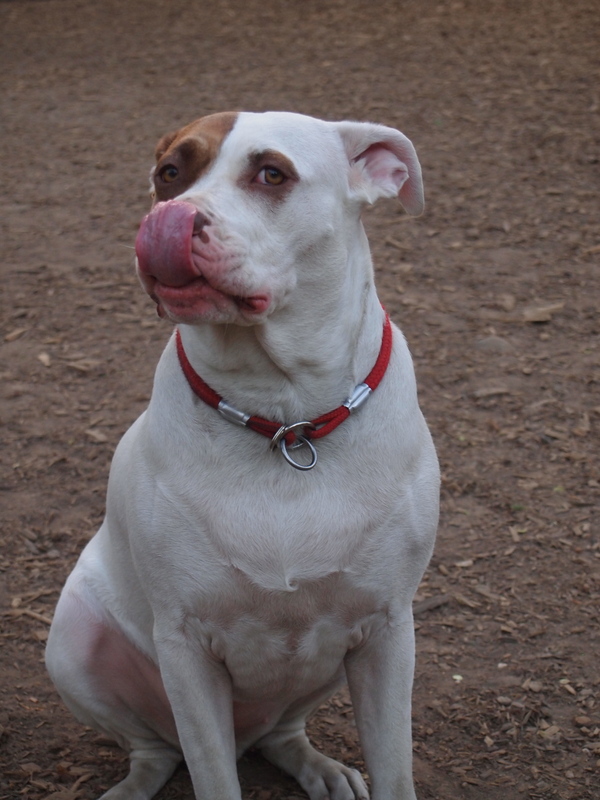 Sonja was actually our very first Adoptable Pittie of the Week of 2012. But guess what? She’s still adoptable! What the heck, people?! Please don’t let Sonja go without a forever home anymore. Share with your friends and your social networks and let’s find this super-deserving girl a great home! 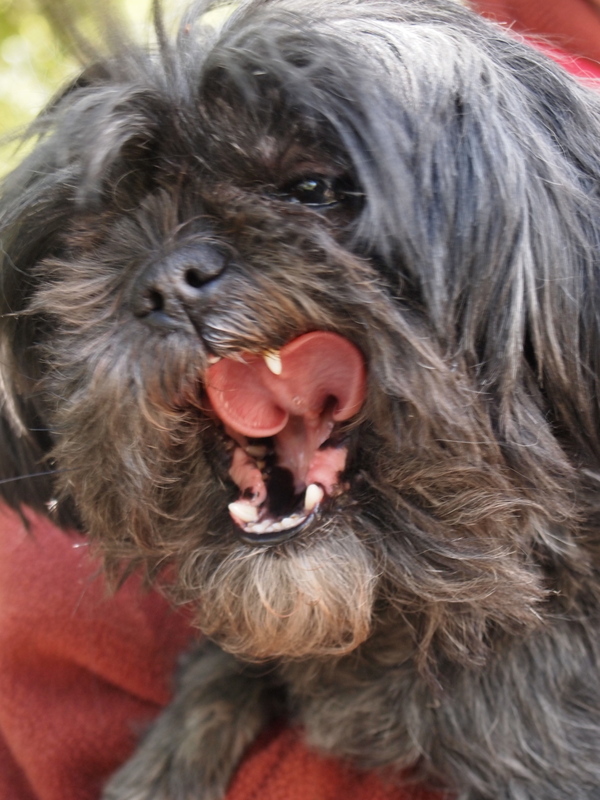 For more information, check out her profile on Petfinder on how to apply to adopt. As many of you know, 5 years ago this week, dogfighting became a national headline. We will never forget the headlines, photos and stories. But, we must say, over the past few years, when we think of the Vick dogs, we often smile and cry with happiness. All you have to do is look at Cherry Garcia with the latest addition to her family – a bouncing baby boy! From therapy dogs to family pets to good old goofballs, the dogs of BadNewz Kennels, are now bringing much joy to many people and changing perceptions. If you need a refresher or just want to see some of the Vicktory Dogs, PBS aired a great (cliffnotes) segment about the Vick dogs last year. The story includes interviews with Donna and Tim from BADRAP along with follow-ups on Audie, Jonny Justice and Hector! Georgia, a Vick dog that has spent her time at Best Friends, has finally found a forever home. Lastly, Handsome Dan’s rescue is organizing an ebay auction to raise funds for their rescue organization, including a copy of Jim Gorant’s The Lost Dogs that’s been pawtographed by four of the rescued Vick dogs. These dogs surely paved the way for future victims of cruelty. Last year, while visiting Animal Farm Foundation, we had the opportunity to meet a boy who stole our hearts. 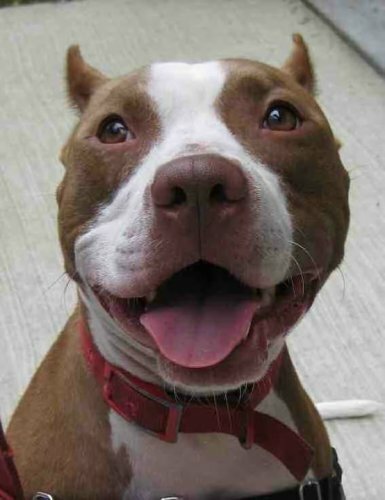 His name was Yukon Cornelius and he was one of 200 dogs taken from a cruelty case which included reported dogfighting. This poor dog was tied to tire for his entire life and lived in swamp-like conditions. While meeting him, he never showed any grudge to the human race. He was all wiggles and kisses. 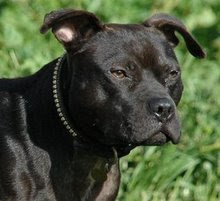 You can check out his wags in this news story about pitbulls and the misconceptions society holds against them. 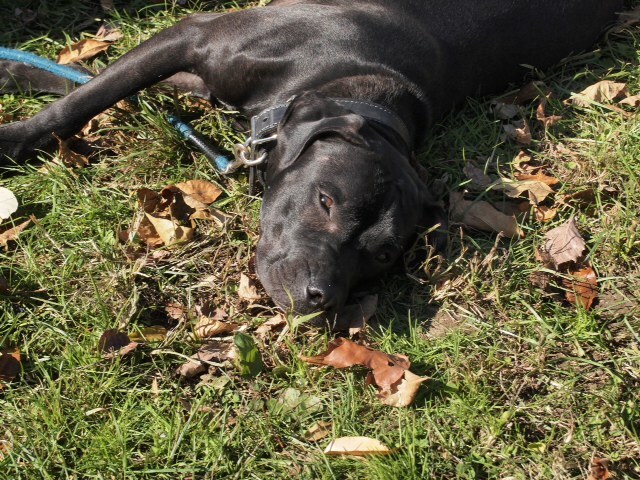 Without the advocacy of groups like BAPRAP, Best Friends and the ASPCA, and the precedence of the Michael Vick cruelty case and rescue, Yukon might not have been saved. Check out more pictures of Sassy in Rescue-A-Bull’s Facebook Photo Album here. And apply to adopt her here. 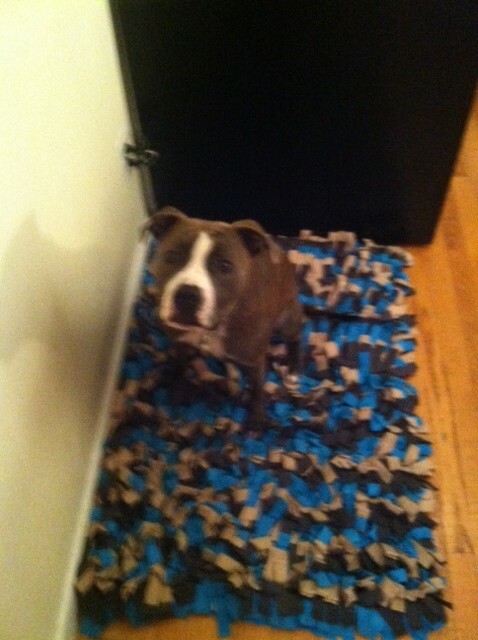 On Monday, I found out that I was the lucky recipient of a brand new Meadow Pet Rug from Wildebeest. All I had to do was “Like” them on Facebook, and I was chosen as the winner! Hooray! And wouldn’t you know it? My prize arrived yesterday – ON MY BIRTHDAY! At the first chance I got, I brought it home and snapped a couple of pictures of Lucy on her brand new bed! I totally love it! 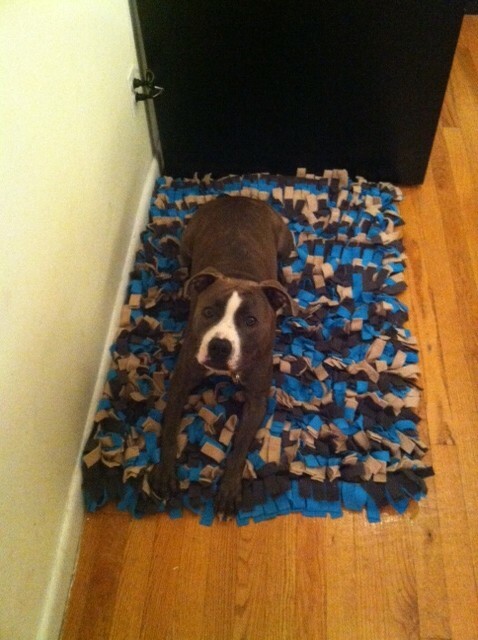 It fits in with my decor already, and Lucy really loves it because it’s soft and comfortable. One thing I didn’t realize (I was just so excited that I ACTUALLY WON SOMETHING) is that the Meadow Pet Rug is just a cover for a bed/cushion – so until the bed I ordered arrives (courtesy of Fab.com), Lucy will continue to use her old bed. But I can’t wait to do the official switch! Thanks so much, Wildebeest, for my wonderful birthday surprise! *Editor’s Note: Wildebeest put no requirements on prize acceptance. I was not asked to write a review or do anything in return for the Meadow Pet Rug. Today is my Dad’s birthday. He thinks I should be making a big deal out of it, but I want to talk about something else for a second. Is that okay with everyone? About four years ago, Grandma got very sick. At least, that’s what everyone says – I wasn’t even born then! Dad said she had cancer, and she could have died. Hearing this made me very, very sad because I love Grandma – and can you imagine if she I had never met me her?! You see, when I was first adopted, Grandma wasn’t so sure about me. She said that pit bulls could be dangerous and challenging, and did Dad,” really want a pit bull for your first dog?” So Dad and I worked extra hard so that I would learn to be a good girl and make Grandma love me. And love me she does! A few years after Grandma beat her first cancer (she has someone else’s liver! Crazy! ), it came back in her lung. Everyone was very worried, except Grandma, of course. She’s a very strong lady, and she beat the cancer, AGAIN! We all consider ourselves very, very lucky. In 2012, it is expected that 1.5 million people will be diagnosed with cancer, and one third of those people will not survive their battles. More than a fourth of those deaths are projected to be caused specifically by lung cancer – exactly what Grandma had the second time. The only thing Dad is asking from his friends and family as a present is a donation to the American Cancer Society through his Relay for Life fundraiser. The ACS helps by providing information about the disease, how to prevent it, how to detect it, and how best to pursue treatment. They also provide critical emotional support to people and families who are struggling with cancer. They’re available 24 hours a day, 7 days a week, even on holidays, to help anyone dealing with a cancer-related crisis to provide crucial information in their time of need. So, as you can see, every little bit helps, so whatever you’re able to give helps A LOT. Today, on my Dad’s birthday, it would really mean a lot to him, and to me, and to Grandma, too. So, please: donate now. Even though our pack walking group is called the Big Apple Pittie Pack, we strive to include dogs of any other breed in our outings. Why would we do this, you ask, if we’re pittie advocates? Well – you’ve answered your own question! As pittie advocates, our goal is to make an impression on the people around us, who may have misconceptions about the dogs we love so much. In adding dogs of any breed to our pack walks, we’re forcing the public around us to see all of our dogs as just that – dogs. Not just judge them based on their breed. 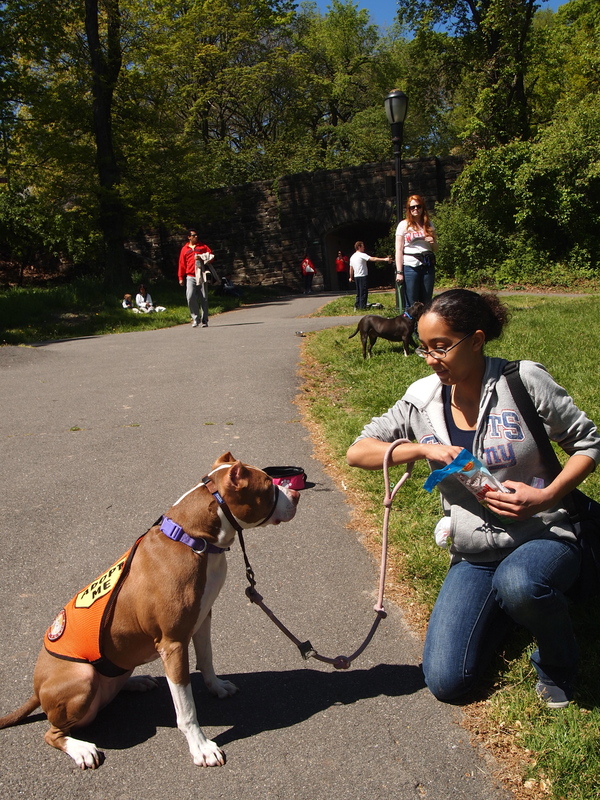 On this past weekend’s pack walk, we had two new walkers join us: Jax and Stella. 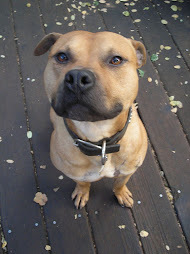 Some of you may know Jax as the best friend of Havi, the Pittie from Two Grad Students and a Pittie. 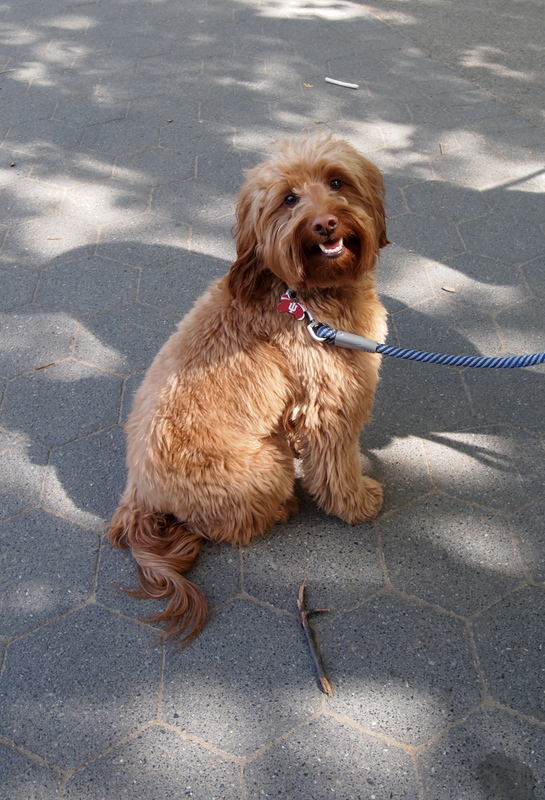 He finally got to join us on one of our walks, and we hope he continues to come along! Havi loved having him around, and everyone else did too! 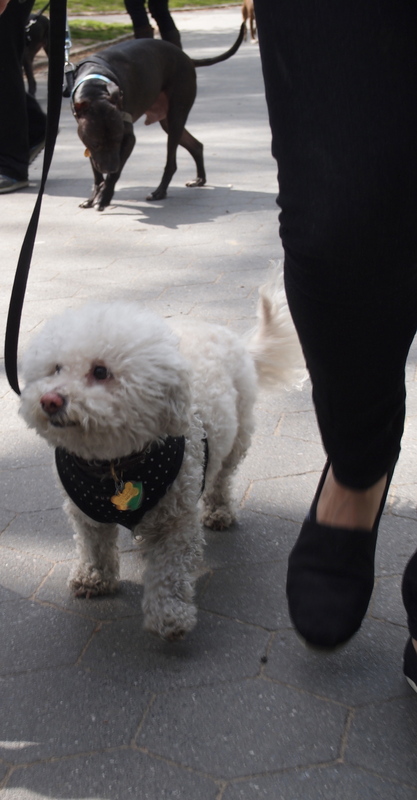 Stella is a middle-aged Bichon-y/Poodle-y girl with lots of pep! She’s one of the locals in Josh’s neighborhood and he and Lucy have become very friendly with her and her parents. Stella can sometimes be a little shy around other dogs, but her parents discovered that she’s great around larger dogs like pitties. 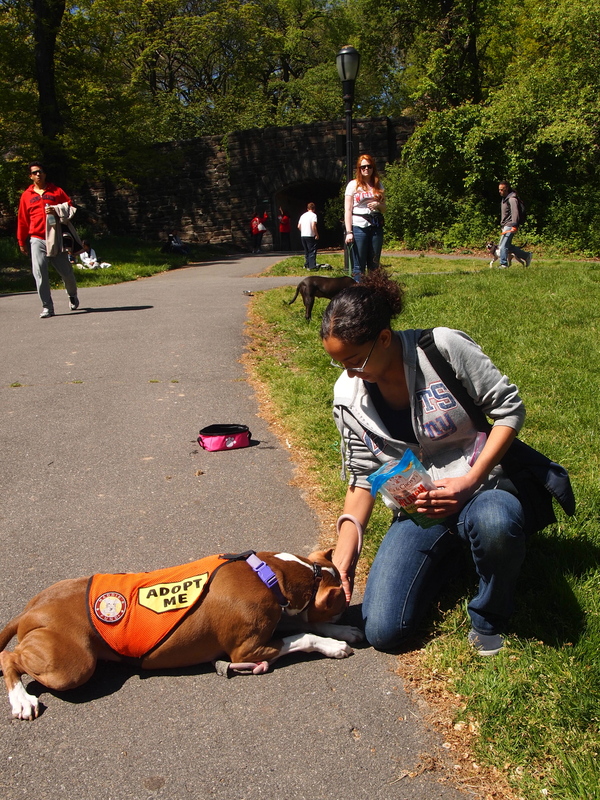 It gives her confidence a big boost to feel like she’s one of the big boys and girls – and she was the star of our walk. Because of her age, she does have a bit of trouble walking for long distances, so she compensates for it by skipping along. When people in Central Park saw a group of 12 pitties with these 2 fluffy pups in the mix, it brought huge smiles to their faces – exactly the reaction we’re looking for! They didn’t see the images their minds would normally see, but they saw a group of 14 dogs and their families having a great morning walk in the park! 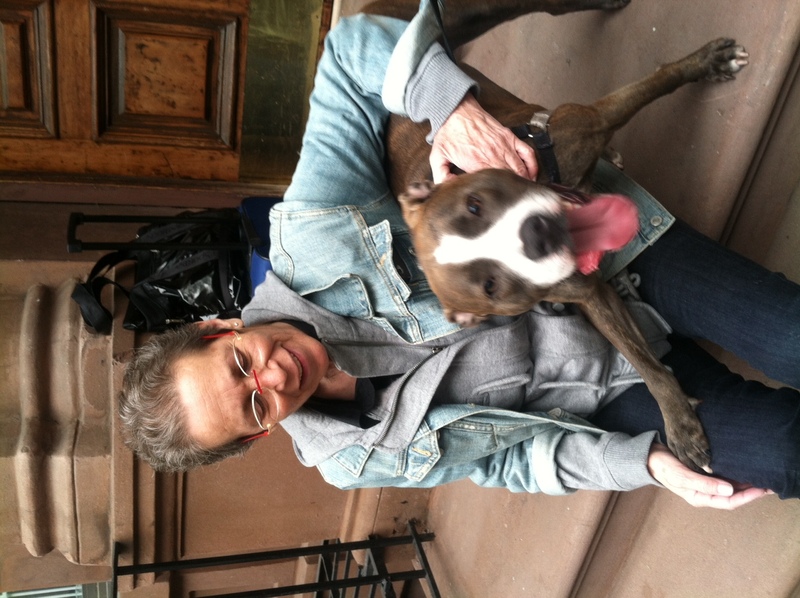 This week’s adoptable pittie was pulled from Manhattan’s Animal Care & Control facility by the Picasso Veterinary Fund of the Mayor’s Alliance for New York City’s Animals – the same organization that currently still has our wonderful Pinky available for adoption, too! If you are interested in adopting Solo please contact the shelter at pvfadoption@animalalliancenyc.org or (212) 564-4604 ext 3. Last night we got a message that one of our Bully Project teams found a stray dog and they needed to find a foster since family members in the home are allergic and two dogs were too much for the household. Of course, we assumed it was going to be a pitbull! Nope! 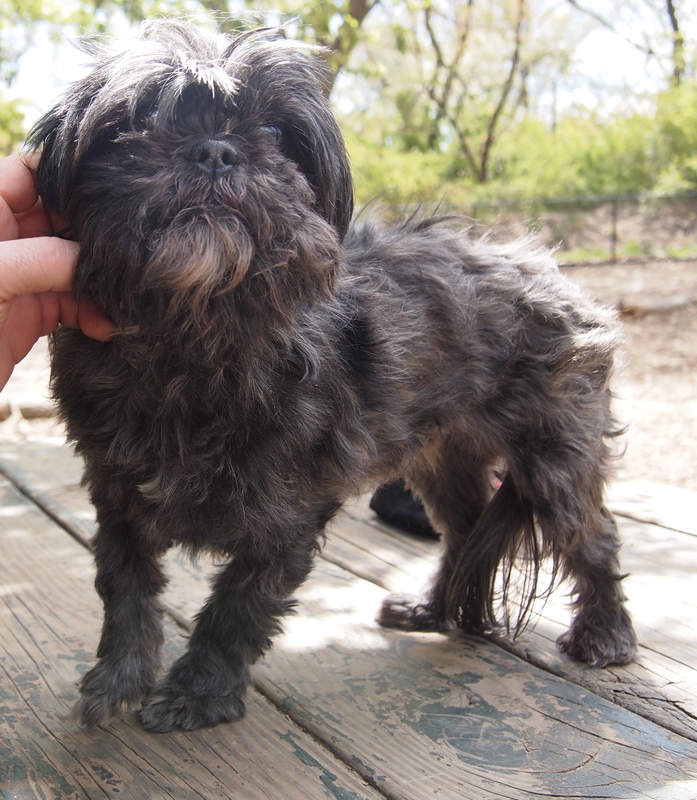 A tiny little Shih Tzu who was shy but ever so sweet! Quickly, all the dog-run regulars fell in love with her, and all the dogs became interested and invited her into their pack! One dog run family, in particular, was smitten with her and promised to take her home, clean her up, feed her yummy home made food (she is a bit underweight) and foster her until her original family is found, or a new forever home is found. She doesn’t have a microchip, and wasn’t wearing tags. And no signs (yet) of someone looking for this girl. 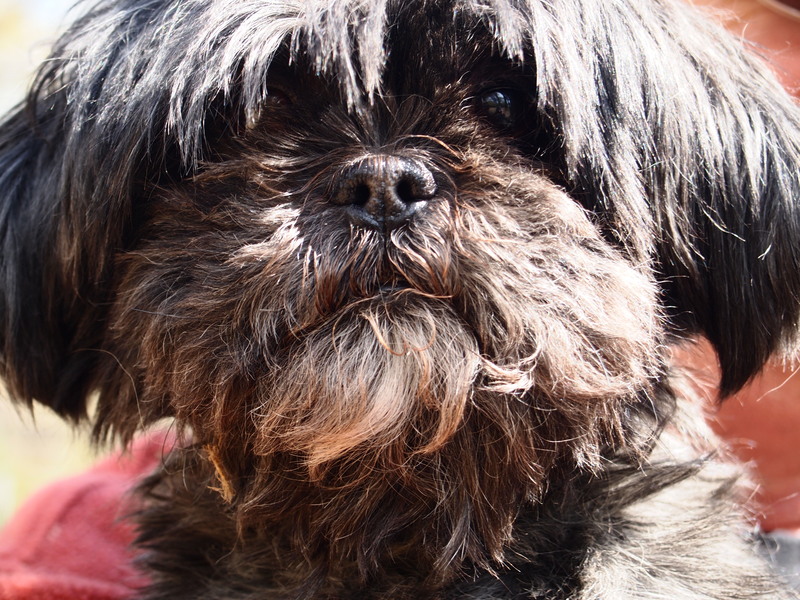 No worries though – the black beauty is now snuggling with two loving a humans, a shepherd mix, a pekinese in addition to a poodle mix who is visiting. Dogs can surely bring people together and here is an instance where it can help an animal in need. 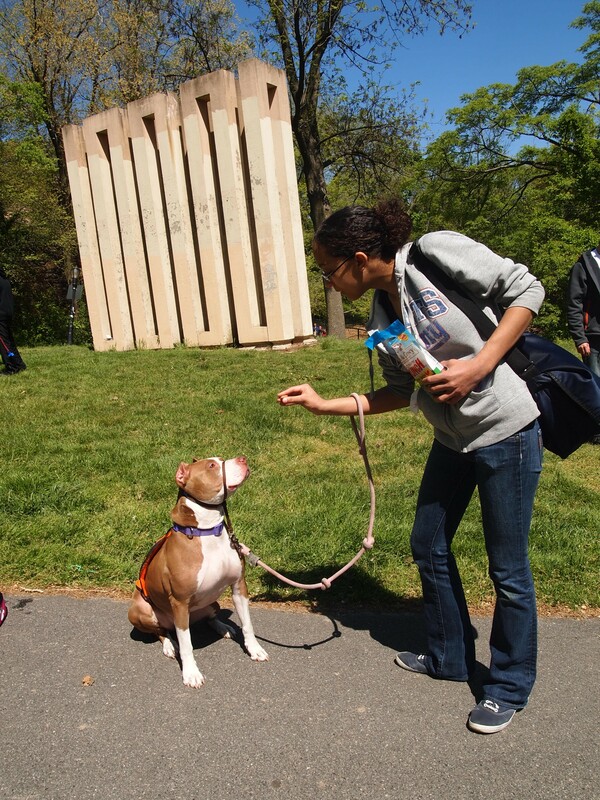 Bully Project goes beyond learning basic commands and training – its about relationship building …and community building. And what kind of animal advocacy organization would we be to always remain breed specific? If there’s a dog in need, regardless of whether or not it’s a pittie, we’re going to do everything we can possibly do to help!